I would love to win this and share it with the Olive Free Library in W. Goshen NY. Their budget has been badly hit this year. I'd love to share it with my school library-we had our budget cut by 50%. And they're taking it better than the art department(who complain at us every lesson). This was a cool idea =) I'd love to have my hands on E.J. 's 3rd book in this series. Love her characters and also a fun way for others to start this series as well. Thanks for the giveaway. Thanks I'm so happy. This Young Adult would be so happy to win. The Legend of Witchrot has such an awesome name. Thanks E.J.! Thank you for the giveaway! I can't wait to read this series!! Great idea! Anything that promotes children and teens reading is a good idea in my books! Thanks for the contest! :)I think my local library would appreciate the boost - especially since a couple of months ago our Mayor tried to shut down our libraries ... not cool, Mr. Mayor. Not cool. Great idea and please enter me - I would definitely share with my wonderful local library that I adore :) Thanks for the giveaway. 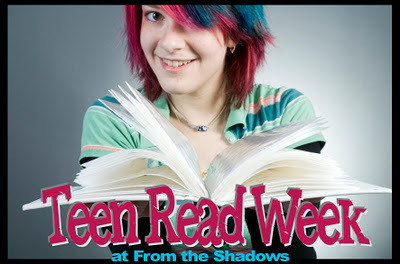 Thank you all so much for stopping by and kicking off Teen Read Week here at From the Shadows! I am saddened to read about SO many library and school budget cuts. *le sight* Literacy, and the life long love of reading that can grow from the gift of literacy, is important. As I tweeted last week; If you give a child a book, a mind is opened to the infinite possibilities of imagination. Awesome giveaway! I would love to share a copy with my local library or high school. I've been signing up for giveaways all over trying to get this one X-D katy.sozaeva@gmail.com since I don't have affiliation with any particular school or whatever, I'll let you choose where the 2nd copy goes. This is also something I feel real strong about, also. I have a friend that teaches 7th grade and most of my read YA books go to her classroom library to be shared with her students. What a great giveaway! I love donating books to my local library! Plus, I would love to read this book. I might even be able to get my son to read it. Thank you all so much for joining our Teen Read Week celebration! Lisa: I have donated to so many libraries and believe that contributing during October, which is also National Bullying Prevention month, is important. I can say honestly that books saved me from the darkness of my teen years. YA Saves! Giving the gift of books is so important. I have the first two and would love to read the third. My local library is expanding. They have just built on another location and I am sure they could use the book. (They have been closed for a month and are reopening on the 29th. Many people in the community are having withdrawls right now.) I might choose to give it to my daughters school library. I would see who needed it more. What a great idea for a giveaway! Thanks. Thanks! This looks like a great book for both me and my library! Amazing giveaway! I love things like #TeenReadWeek - really highlights the importance of YA literature and the affect it has on Teens and Readers. Thank you so much! This seems like a very interesting give-away!